Not always a go-to genre for me, Cynthia Eden just may have me picking up more romantic suspense in the future. The LOST Team (Last Option Search Team) is back on the case in New Orleans, and nothing is truly as you thought it was. Jax is a member of LOST, a total badass and while not always completely on the right side of the law, he is committed to his team, their missions and those he is tasked to find (or protect). He’s not the typical bad boy though: there is heart and caring underneath the get it done exterior, and his desire and caring for Sarah is palpable. Sarah is a criminal psychologist, and there is something to be said for her looking to her past to inform her career. With a father of dubious morals, she’s encountered the dark side more personally than many, and her ability to not shrink away from difficult or emotionally taxing situations show an iron core that doesn’t diminish from her ability to be vulnerable and admit when she is in over her head. An attack on Sarah throws she and Jax into a maelstrom, and with a girl turning up missing that coincides with Sarah’s attack, everything starts to twist and turn into a giant, edge of your seat, read with the lights on story. With plenty of heart and heat between Sarah and Jax, angst as Sarah faces demons and darkness from her past and the overriding mystery, this story was jam packed with thrills galore. In New York Times bestselling author Cynthia Eden's latest novel featuring the Last Option Search Team (LOST), one agent is forced to face her past as she uncovers secrets about the man who may be the key to her future. Criminal psychologist Dr. Sarah Jacobs is all too familiar with the kind of bad boys who belong behind bars. But the dark, dangerous man she meets in the New Orleans underworld is a new kind of ruthless, and all too irresistible. 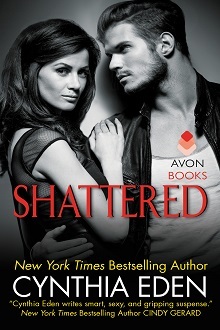 And when a deranged killer targets Sarah, Jax will do whatever it takes to keep her safe. Sarah backed up a step. Sarah pretty much ran for the door. But he caught her. His hands wrapped around her and Jax pulled her back against his body. His hold wasn’t hard or rough. Oddly, it was infinitely tender. “Do you know what I saw when I looked in your eyes?” he whispered into her ear. Tears stung her eyes. “You don’t know me. Or what I’ve done.” Jax thought his past was bad? It was nothing compared to hers. She still had nightmares that had her waking in the night, choking for breath, and begging for help. Help that hadn’t come. Not in time. She sucked in a quick breath and decided to go with the truth. “Because I didn’t want to lie in bed and be afraid. Because I didn’t want to think about the past or the future.” Because she’d felt that insane connection between them, too. He can handle all my darkness. He won’t ever be afraid of what I tell him. Because his gaze had told her that he’d already looked into hell … and hadn’t given a damn about the demons there. He turned her in his arms. She made herself look up and into his eyes. He was so warm and strong against her. And he made her … want. Yearn for things that she’d denied herself for so very long. Because she hadn’t wanted anyone to get close. She hadn’t trusted anyone with all her secrets. She didn’t trust him, either. She’d be a fool to do that. But—she did want him. And every instinct Sarah possessed screamed at her that Jax Fontaine could give her the sensual oblivion she craved. A few hours to forget. A few hours to just pretend that I’m not the freak in the room. The monster that everyone else fears. “What do you want from me?” Jax asked her. Just a night. She’d be leaving New Orleans soon, flying out on a plane and heading back to her little house in the suburbs of Atlanta. They wouldn’t see each other again. So no one else would know about what happened tonight. Just her. Award-winning author CYNTHIA EDEN writes dark tales of paranormal romance and romantic suspense. She is a New York Times, USA Today, Digital Book World, and IndieReader best-seller. Cynthia is also a two-time finalist for the RITA® award (she was a finalist both in the romantic suspense category and in the paranormal romance category). Since she began writing full-time in 2005, Cynthia has written over thirty novels and novellas. Cynthia lives along the Alabama Gulf Coast. She loves romance novels, horror movies, and chocolate. Her favorite hobbies include hiking in the mountains (searching for waterfalls) and spelunking.